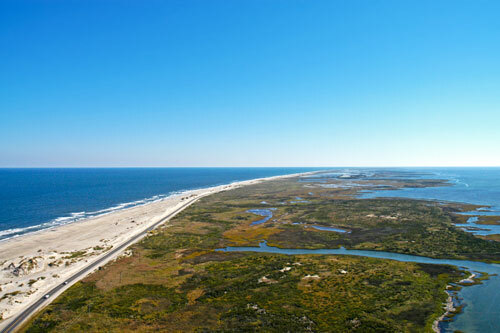 On the central Outer Banks there are two main roads of travel: the Bypass and the Beach Road. These roads run parallel to each other through Kitty Hawk, Kill Devil Hills and Nags Head. Both have their own personalities: One is the ambitious go-getter, a strategist always looking for the most efficient way to get the job done; the other is the romantic type, stuck in the past and taking the time to smell the flowers. They are the yin and yang styles of commuting, and neither route is necessarily better than the other, but there are certain instances when you might elect one for its accompanying benefits. Also known as Croatan Highway and U.S. Highway 158, the Bypass is the biggest road on the Outer Banks. With speed limits ranging between 45 and 50 miles per hour, four lanes of traffic and a turning lane, and side roads providing easy access to residential areas, the Bypass tends to be the most efficient way of travel. You can get to the largest number of places fastest by taking the Bypass. It’s lined with a diversity of shops, boutiques, cafes, restaurants, grocery stores, offices, gas stations and Outer Banks attractions. You could easily enjoy a day out at the Outer Banks and not even have to leave the same road. Coveted for its directness, the Bypass definitely tends to be the popular method for travel. Consequently it is popularly traveled. In the summer this means that heavy traffic can lead to slower travel and difficulty with changing lanes and turning. And it takes on a whole new dimension if you’re heading somewhere new and aren’t familiar with the directions. With packed lanes to the left and to the right, it can be tempting to cruise down the turn lane for a distance. Resist the temptation. Cars turn into it quickly, and oncoming traffic makes it hard for left-turning cars to get a clear view. Even though the posted speed limit is 45 or 50 mph, be prepared to travel at slower speeds and pay extra close attention in the summer months. Be on the lookout for cars ahead of you suddenly braking or switching lanes. The Beach Road is officially N.C. Highway 12 and the street signs read Virginia Dare Trail. Driving on the Beach Road is like a step back in time. You see more of the old Outer Banks along this road, including the signature cedar-shake cottages and mom-n-pop businesses. It parallels the beach, and much of the road is lined with sand dunes. Be sure to take a peek through the gaps in them to catch a glimpse of the ocean’s crashing waves. Time moves a little slower . . . literally — the speed limit remains 35 miles per hour from Kitty Hawk through Nags Head. The Beach Road has only one stoplight, in Kill Devil Hills. But keep in mind that you’re often sharing the Beach Road with pedestrians and cyclists. Be wary of anyone darting out from behind parked cars or trash cans on the side of the road. The Beach Road also has more crosswalks than the Bypass, and Dare County law requires that cars stop for pedestrians (but pedestrians should never assume that this guarantees that traffic stops for you!). This can lead to a lot of stop and start traffic in the summer months so pay close attention. If you have a few minutes to spare, opt to take the Beach Road. With less traffic and an aesthetic like no other, driving along it is meditative in a way. Roll down the windows and let that sea-salty air flood the car. Slow down enough to listen to the roar of the waves. You may not reach your destination as quickly as you would via the Bypass, but when you factor in the difference in summertime or rush hour traffic, it might be worth it. Once N.C. Highway 12 stretches into Southern Shores and on up to Corolla, it is no longer referred to as the Beach Road. 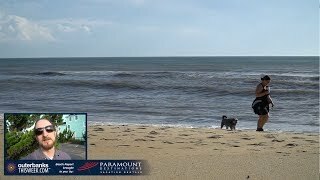 To the south, the highway stretches down to Cape Hatteras National Seashore, where it picks up to 55 mph and then drops at points as you wind through the villages on Hatteras Island.